1) Peel prawns and de-vein, wash under running cold potable water. 2) Place shallots, garlic and green chilies in a food processor. Puree until it turns into a thick paste. 3) Dice capsicum and set aside. Add brandy and mayo into food processor and blitz for 1 minute or until the mixture is well incorporated. 4) Place mixture in a metal bowl and slowly mix in capsicum and season with salt and pepper. Set aside. 5) Deep fry carrots till crispy and drain on a paper towel. 6) Mix flour and cornstarch with seasoning. Be sure to sift twice to insure a good mix. 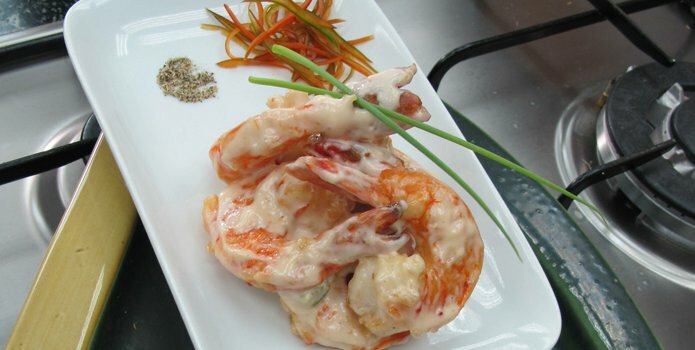 7) Coat prawns in seasoned flour and deep fry or 1 minute or until golden brown. 8) Remove from oil and drain on a paper towel. 9) To serve spoon sauce on bottom of bowl or plate then build a pile of crispy prawns. Top with crispy fried carrots and serve.